It is funny where perfume might lead you. Late last week, I suddenly found myself tumbling down a rabbit-hole full of fascinating information, nostalgia and whimsy. All this began when I chanced upon a small bottle of Parfum at a Danish fleamarket, that I knew absolutely nothing about. When I got back home and spent some time on Google, I found that the scent "Anonym" was an oriental-style perfume released by German company Patrizier Haus, in Köln in the early 1960's. It was one of a number of scents produced under the company umbrella of Jünger & Gebhardt - a firm with its roots planted firmly in the late 19th century. A little more digging online, and I discovered a sister-scent named Torero Spanisch Juchten. 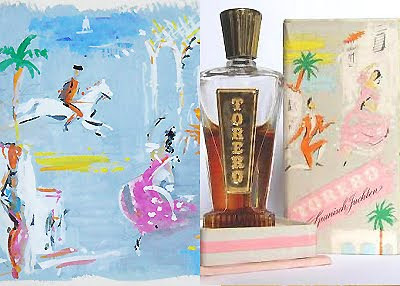 What struck me about the photograph that Google's image search had yielded, was the cheerful illustration pictured on Torero's packaging. I am, after all a graphic artist by profession, and I lingered for a moment, admiring its undemanding frankness. I found the muted colour palette and typographical solution very typical of print advertising in the 1960's. I dug a little deeper. I googled the name of the perfume again and cast my net wider. This time a listing from ebay emerged, though it was not what I had expected. 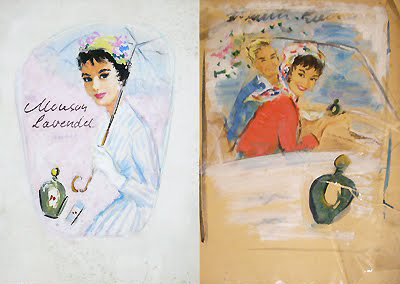 What I found instead, was an auction for one of the original hand-painted drafts of the final Torero Spanisch Juchten packaging artwork. The paper corners were dog-eared and discoloured with age, but the watercolours as vivid and lively as ever. And there were more. Many more... at least twenty additional listings of beautiful renderings that had been stored and preserved over the years; an absolute visual feast for this graphic artist and perfume enthusiast. I clicked through delightful depictions of Hepburn-esque women cradling smokey-green flacons of Mouson Lavendel in their gloved hands; romantic portraits of couples dancing around glinting bottles of Tosca, and taking snowy horse-drawn carriage rides beyond packshots of Muehlens 4711. These exuberant images still speak of an age in Europe full of optimism, glamour and elegance. The "cultural logic" of the 60's had been preserved perfectly on pieces of card and snippets of paper, and they could be yours... if you would just click "Buy it Now". I fed the German 'terms of sale' through an online translator and as anticipated, it spat out a rather poor English translation. I was able to deduce however, that these pieces were offered for sale as samples from the former artist's estate. The artist's name was Helga Tiemann, and I googled it. I was left looking at the photographic portrait of the artist, pictured above - her black and white image, seen seated amongst her canvases. My eyes passed over her kind face and frail frame, and I felt a pang of sadness. I soon learned that Helga Tiemann was in fact one of Germany's most revered portrait painters and educators for commercial art. Born in Remscheid Germany in 1917, Tiemann grew up to study at the College of Fine Arts in Berlin between 1937 and 1945. Her first caricatures were of her teachers, and after the war, she painted a series of Russian soldiers and officers. 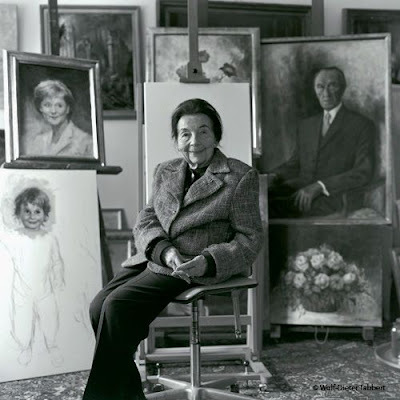 National success came after she completed portraits of German statesmen Konrad Adenauer and Theodor Heuss and she went on to exhibit her work in both Germany and abroad. All the while as a part of her commercial career, she worked with Jünger & Gebhardt on promotional posters and packaging for toiletries and other perfumed products. Whilst you (much like myself) may never have heard of Helga Tiemann until today, in all likelihood you are familiar with her distinct illustrative style which epitomized the era spanning four decades from the 40's, through to the 70's. Right up until her death at the age of 91 in 2008, Tiemann's contribution to the arts has been colossal. Unfortunately for me however, I am not presently in a position to buy these winsome renderings. Perhaps if I had the expendable income, I would not think twice about using that "Buy it Now" button. A little part of me feels sad to think that these treasured pieces of Ms Tiemann's estate are being sold off via such an impersonal platform. I would much rather see a book of her commercial work produced, and perhaps see the originals housed in a gallery or museum. My biggest hope is that some astute ebayer with an admiration of the woman and her work that is somewhat akin to mine, will buy big and treasure them always. 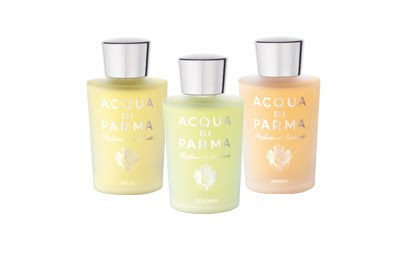 Acqua di Parma - perhaps best known for their luxury leather goods, fine fragrances and scented candles - have expanded their perfume portfolio to accommodate a trio of irresistible room fragrances: Colonia, Ambra (Amber), and Spezie (Spices). Whilst each scent has been created using only a few essential components, the end products feel generous and somewhat complex. I am enchanted by Spezie - an exotic perfumed water brimming with allspice and dramatic florals. If one has ever allowed themselves to be swept away in daydreams of the souks of Marakesch where the midday sun filters through shuttered windows, and the perfume of the spice and flower markets cartwheel in on the air; then you might know what to expect from Spezie. Acqua di Parma have captured the aroma of miniature rosebuds sitting in baskets alongside hard kernels of cardamom and fragrant clove. An uplifting swirl of ylang-ylang creates a luminous opening that stirs the senses. The lasting impression however, is of a very rich jasmine - one peppered with allspice; resolute, heady and narcotising. As a room spray, Spezie furnishes your domicile with an engaging sense of lavishness. Furthermore, if any of these scented molecules should happen to land on your skin, the splendid drydown of spice and jasmine will take you on a magic carpet ride to a remote, seductive landscape. 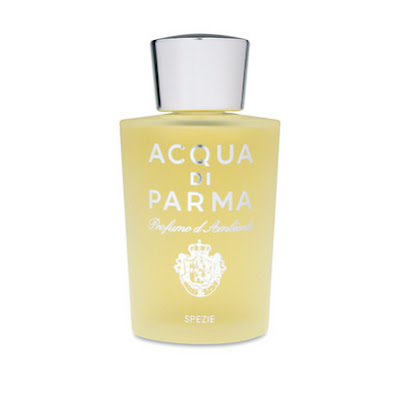 Samples and full bottles of the Acqua di Parma Room Spray range can be purchased in 180ml sizes for a very reasonable €55 at www.ausliebezumduft.de. This morning, I join the fashion world in lamenting the loss of another of their greats: Alexander McQueen. Few designers have changed the course of fashion in the same way McQueen did with his avante garde stylings and creations that embraced the alienesque. His vision was truly extraordinary, and his work revered by millions. Lee Alexander McQueen stepped onto the world stage in 1996 after winning a "British Fashion Designer of the Year" award: an accolade he went on to claim 3 more times by 2003. In 2000, McQueen partnered with the Gucci Group and worked at the helm of his own brand as Creative Director. Since then, McQueen opened boutiques in London, New York, Los Angeles, Milan and Las Vegas, and his unconventional fashion has managed to penetrate the global psyche. In 2000, McQueen launched his first fragrance Kingdom: a scent that was met with polarizing opinions - much like his couture. Kingdom, - packaged in deep garnet-red Venetian glass and glinting rhodium - exhudes a sexual aura of potent spices, dark woods and exotic florals. To this day, it is still considered venturesome and daring. Those with a true appreciation for McQueen's universe can fathom its significance, and recognise its impact on how contemporary perfumes are perceived today. As a visionary, McQueen led the charge and his ongoing contribution to fashion will be missed. If I were asked to predict a current French perfume house which is waiting patiently in the wings to one day ascend to the throne currently occupied by perfume royalty Guerlain, I would likely say Mona di Orio. Guerlain, - though most unlikely to abdicate - are revered and celebrated (amongst others) as pioneers of modern perfumery, particularly at the hands of perfume godfather Jacques Guerlain (1874 - 1963). Their contribution to the art is colossal, and Jacques Guerlain's abstract perfume narratives such as L'Heure Bleue, Shalimar and Vol de Nuit have left their permanent perfumed fingerprint in history. The same could be said for the efforts of French master perfumer Edmond Roudnitska whose creative masterpieces Diorissimo, Eau Savage and Rochas Femme, olfactorily helped reshape the 20th century. Mona di Orio, born in 1969 in Annecy France, became Roudnitska's teenage protégée; studying the art from the grand master himself before his death in 1996. As a result, Mona di Orio developed a fundamental sensitivity towards observing traditional values and garnered an appreciation for raw materials of only the finest quality. Now the creative partner alongside Dutch designer Jeroen Oude Sogtoen at the helm of her eponymous perfume house, this has become very apparent in her work. Seven Mona di Orio perfumes exist to date, and all are intended to transform the wearer with their own unique alchemy on the skin. 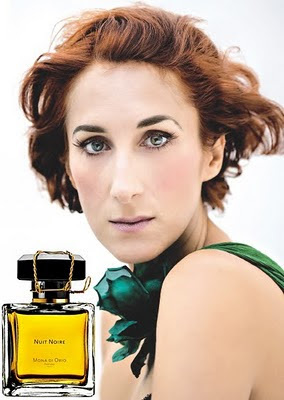 Nuit Noire is one eau de parfum creation that I feel may best illustrate Mona di Orio's tutelage under her mentor Roudnitska, and the vast, timeless heritage behind him. Nuit Noire opens with a delightful orange blossom note which is astutely and instantaneously counterbalanced by a dark, animalic (almost civety) accord of dense cardamom. Immediately, one experiences a sense of wistful recollection; much in the same way as if, perhaps one were turning the foxed pages of an antique family photo album, studying the sepia faces of well-dressed ancestors you have never really known. A complex heart of resins, woods and spices lend infinite depth, whilst a narcotising tuberose accord evokes a feeling of vintage sumptuousness. Hours later, Nuit Noire shifts more toward a creamy leather base. It is whilst familiarising oneself with the wonderful transitory layers of this perfume, that one can truly come to terms with its beauty and complexity. Here, the cherished works of early 20th century perfume virtuosos still resound, albeit now spoken with a contemporary vernacular. I would encourage everyone to try at least one or two scents from the Mona di Orio line. The 2009 release Chamarré is also a favourite, and embraces this concept of tipping its hat, respectfully, to the greats.